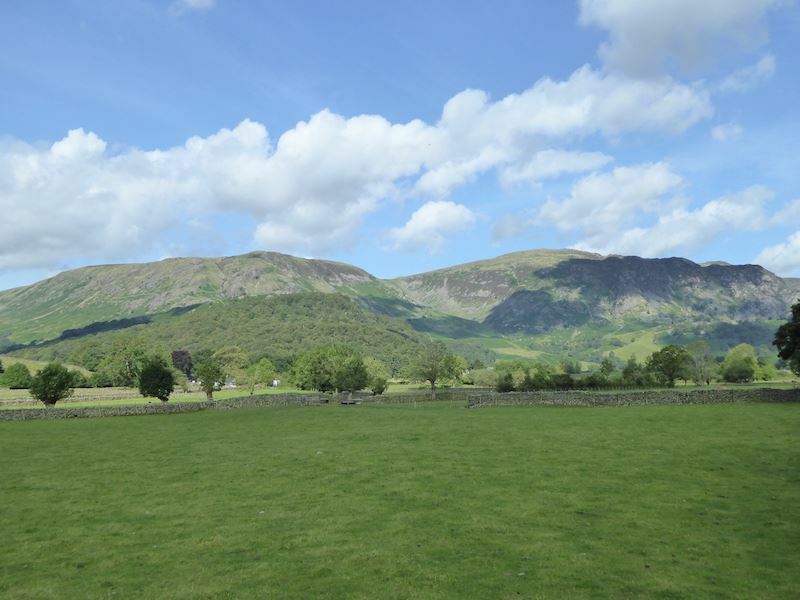 From the lane where we parked in Stonethwaite, and over on the right is the high point of Grange Fell, we’ll be over there a little later. 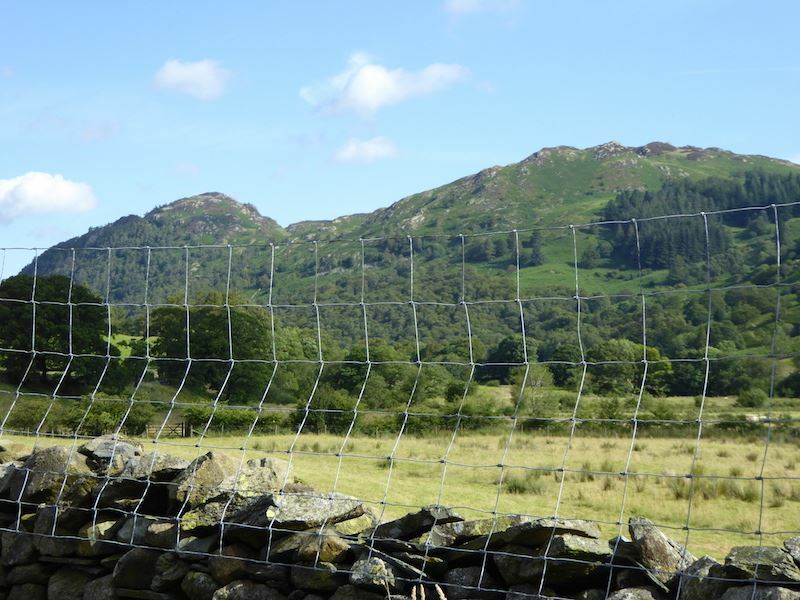 Sorry about the unsightly deer fencing but I couldn’t get the camera through the gaps in it. 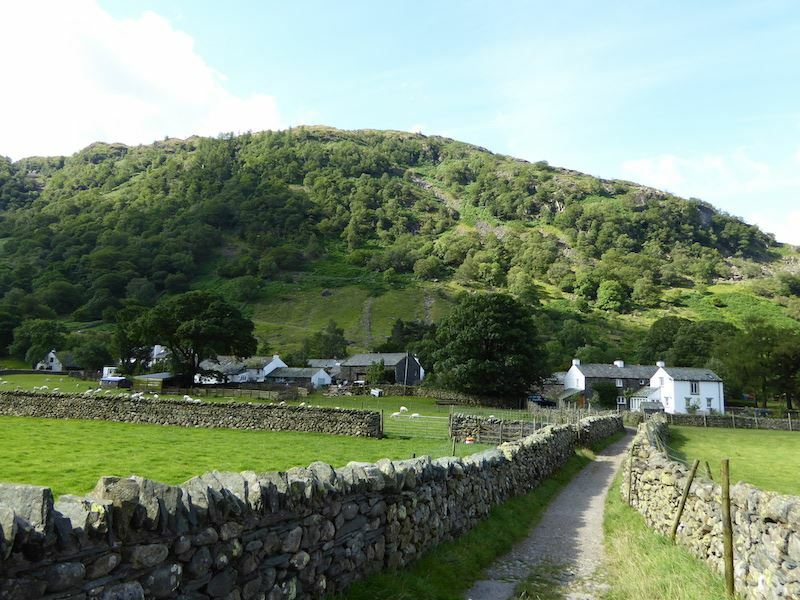 Leaving the little hamlet of Stonethwaite. 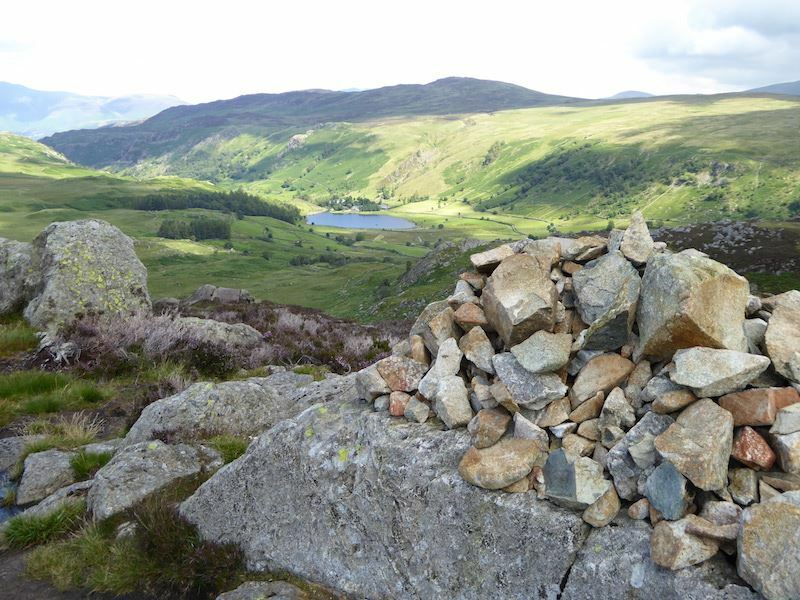 The weather is looking promising, here I’m looking over the High Scawdel and High Spy area. 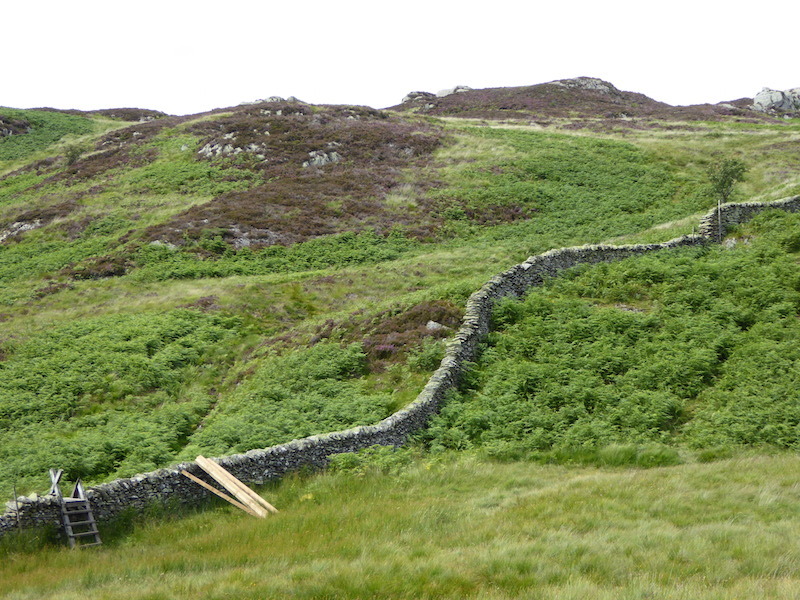 The path up Lingy End begins just by this sheepfold. 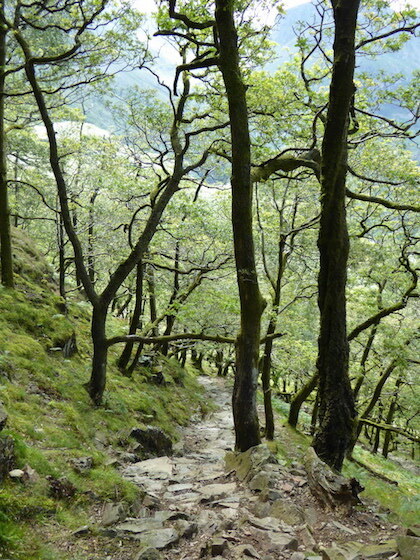 We turn off to the left to climb up Lingy End. 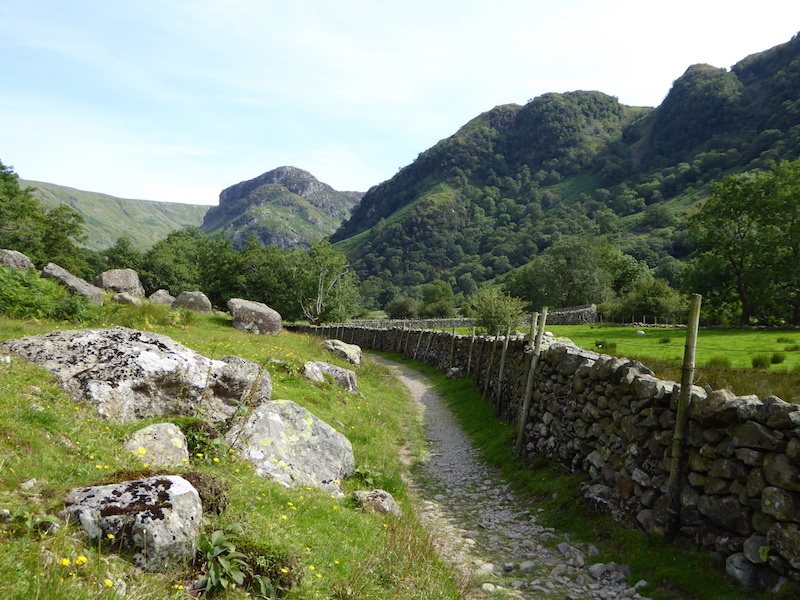 The main path below us continues alongside Stonethwaite Beck, Eagle Crag is the dark craggy fell to the left of centre. Its beginning to look like we’re nearing the top. We’re clear of the woods now and the view opens up. 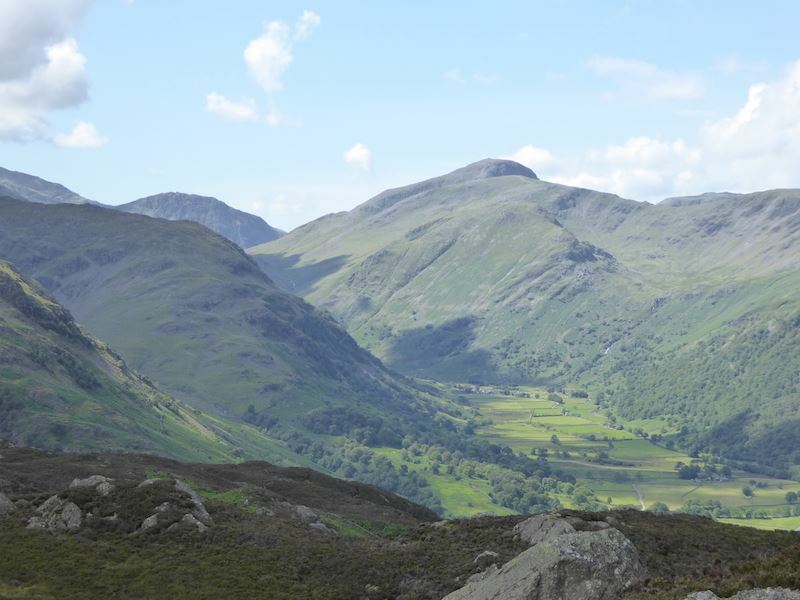 This is looking towards Seatoller and the fells of Grey Knotts, Fleetwith Pike and Dale Head. 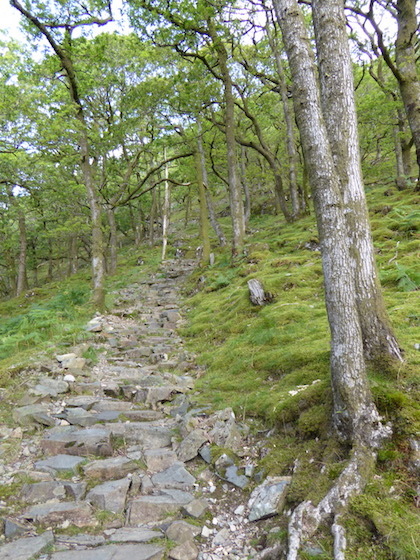 The undulating top of Rosthwaite Fell, or Bessyboot as it is more often called. 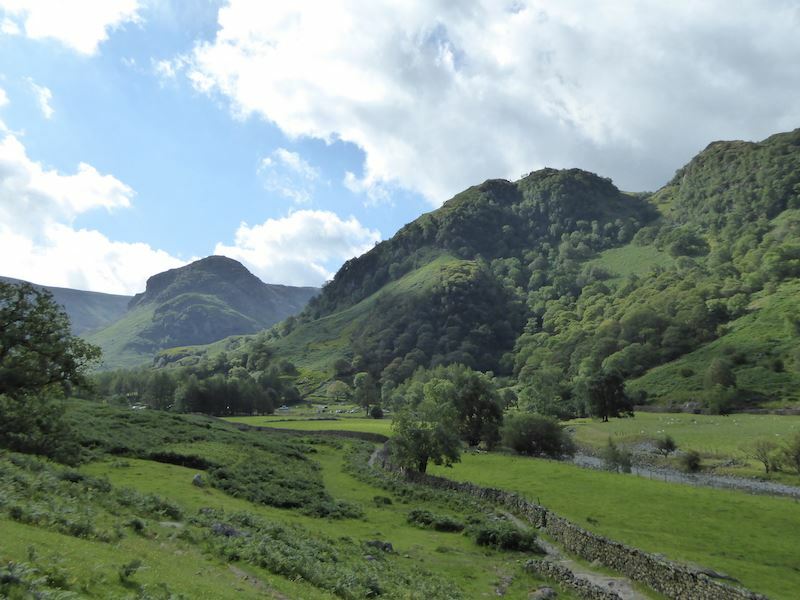 For a while Greenup Edge and Eagle Crag were under a large grey cloud so the photo was an exercise in hope, not expectation. 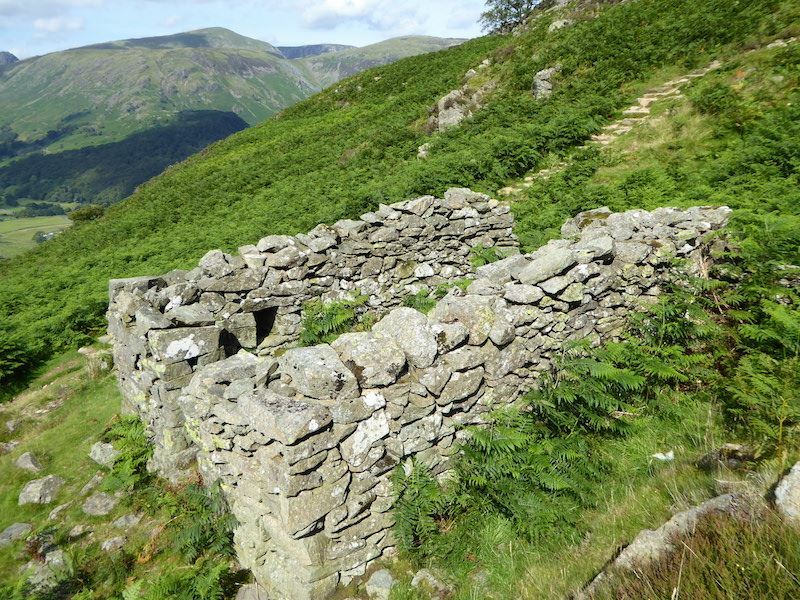 Further up Lingy End is this ruined building, a bit of research revealed that its a shepherd’s bothy. 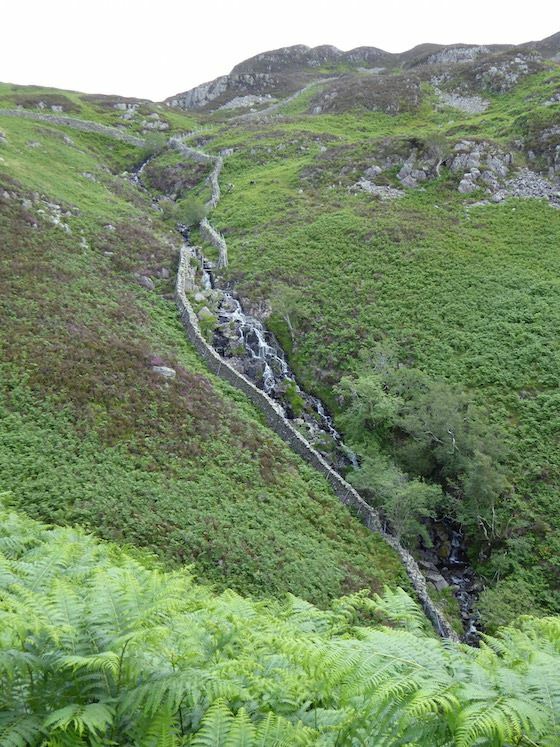 Willygrass Ghyll. 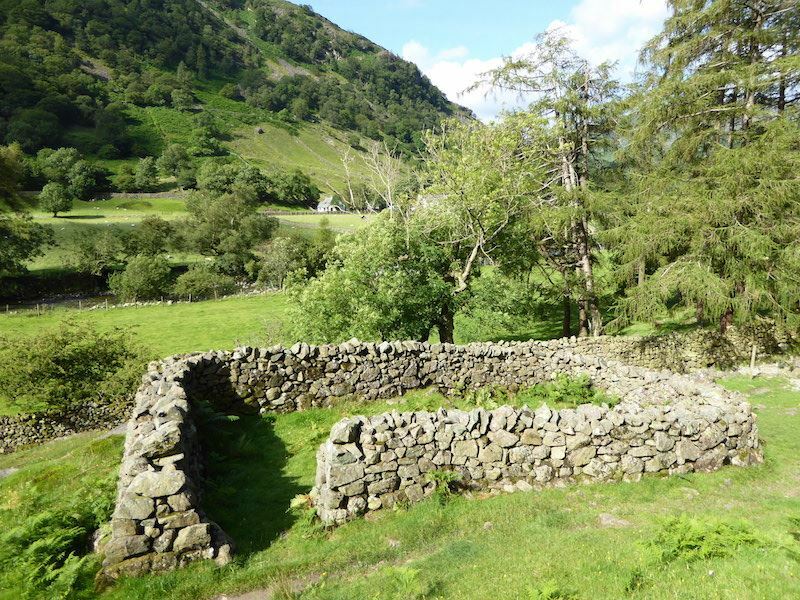 Can you imagine what it must have been like building that wall up the side of it? 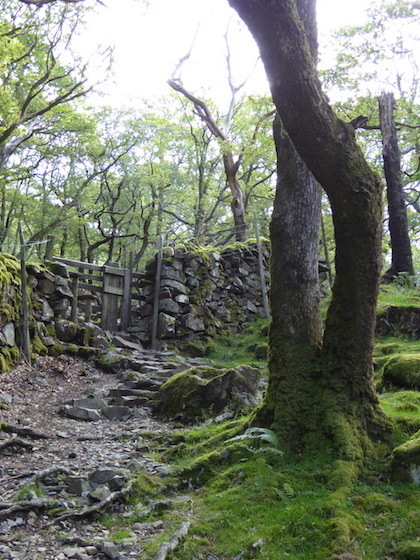 Another stile to deal with before we get to Dock Tarn. 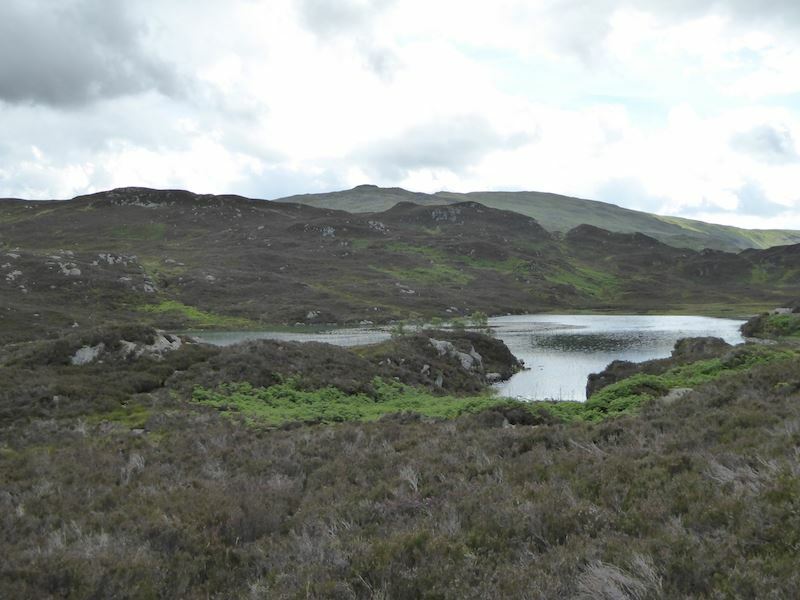 Dock Tarn. Just as we reached the cloud came over so its doesn’t look as sparkly as it should. One of these days I’ll get a decent photo of this tarn. 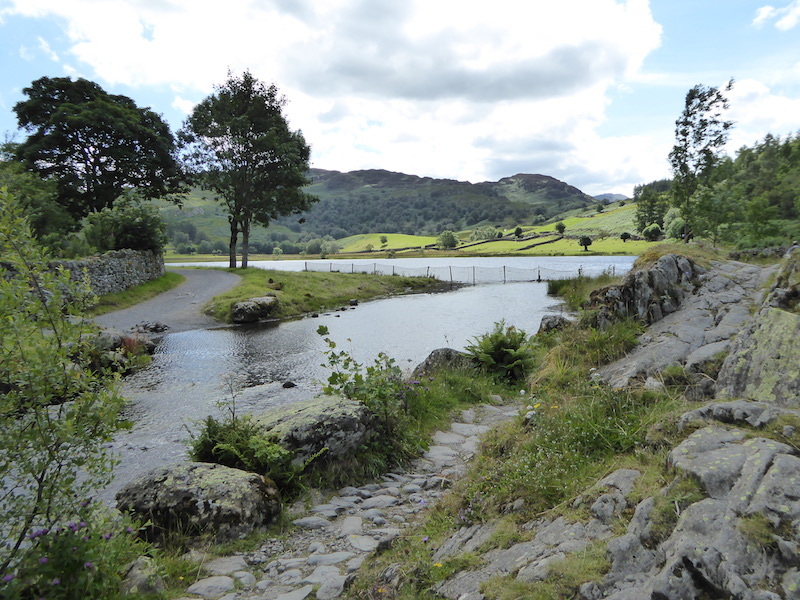 This is the other end of the tarn. A hint of weak sunshine giving a bit of sparkle to the tarn, but you can see the grey clouds above it reflected in the water. 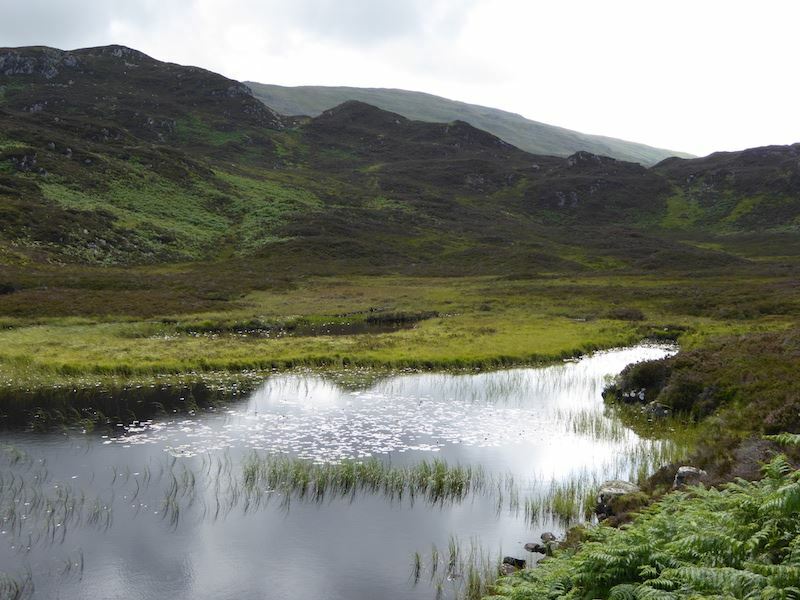 Leaving a gloomy looking Dock Tarn, it wouldn’t surprise me if the sun comes out when we’ve left it behind. 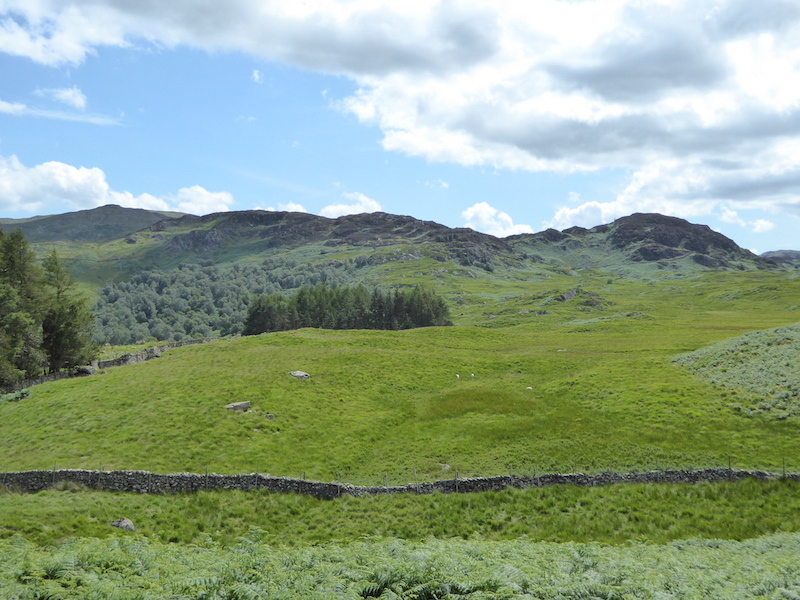 The shadow of the cloud extended well past the little hamlet of Watendlath and its tarn so everything looked a bit gloomy. 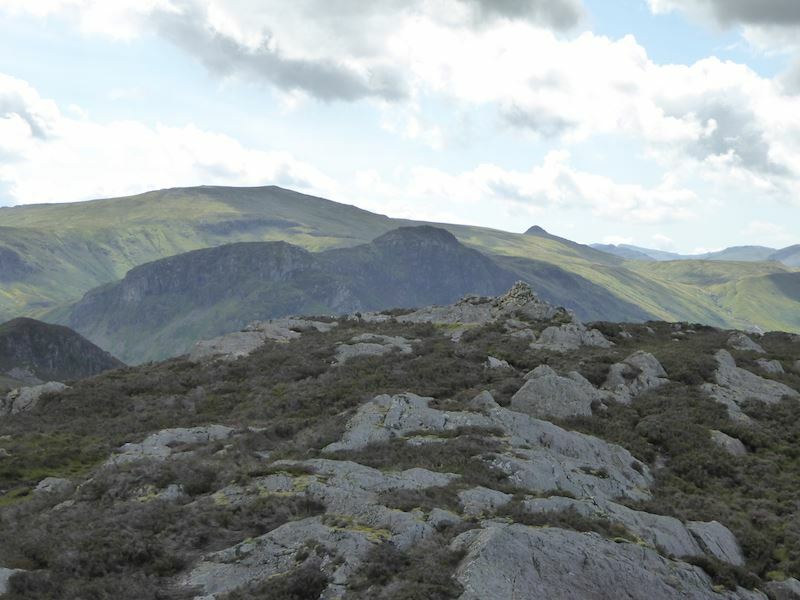 A bit of zoom to show High Raise, left of centre, on the skyline, and Pike O’Stickle just visible to the right. Cloud still over us but it looks nice and sunny over there. 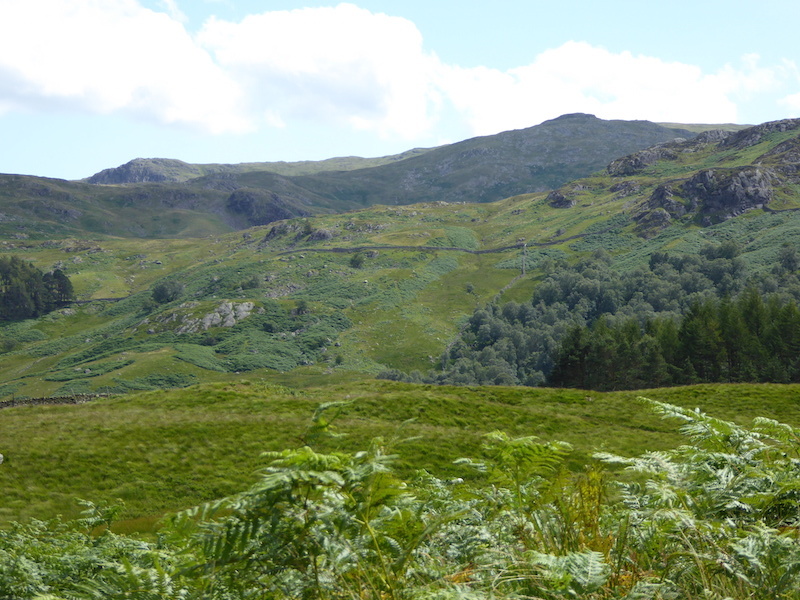 A little patch of sunlight on Rosthwaite Fell with the dark mass of Glaramara just behind it. 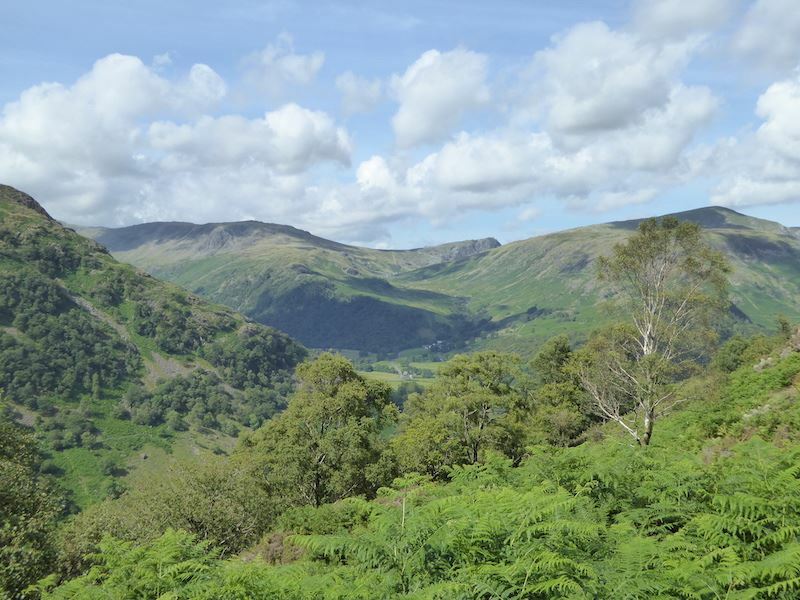 Fells at the head of Borrowdale, the dark curved one is Great End, to its right is Great Gable, drop below that and its Green Gable, and below that is Base Brown. 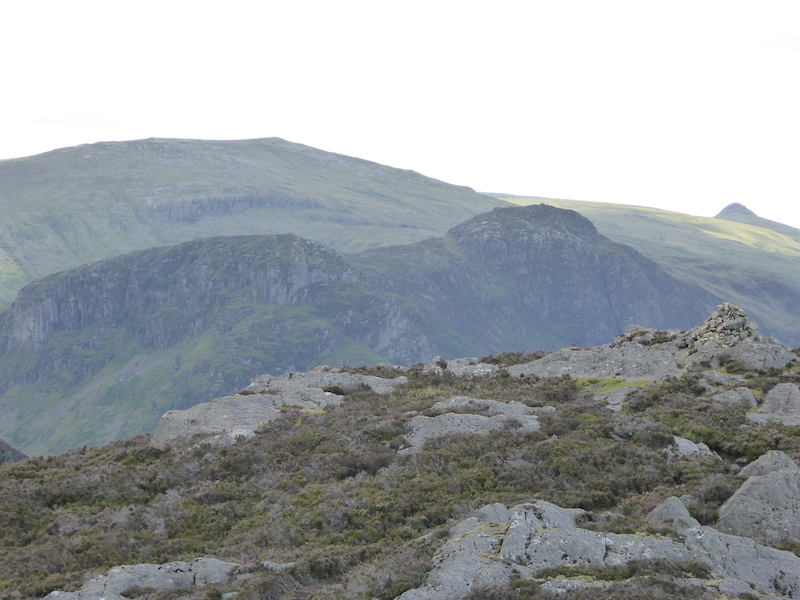 Great Gable again on the extreme left, with Pillar on the extreme right. 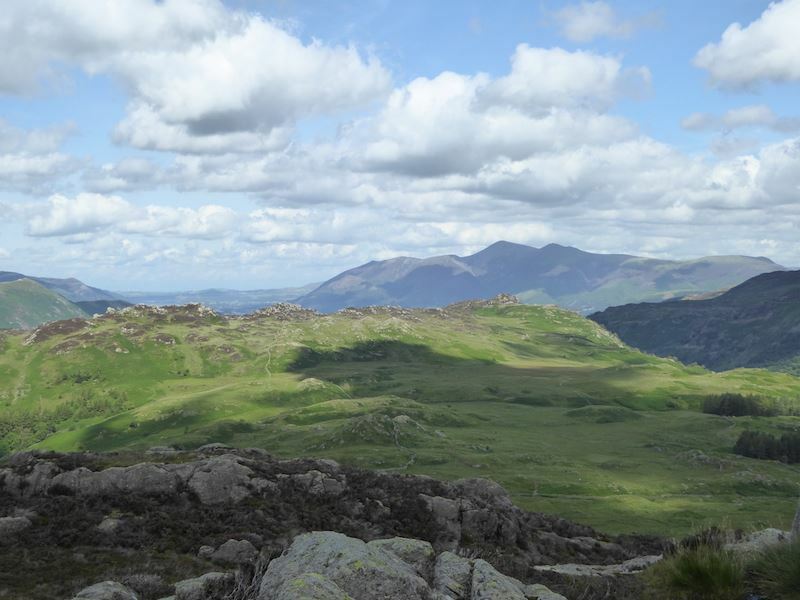 We’re still under that big grey cloud, the fells to the south and west have sun, grrrr. 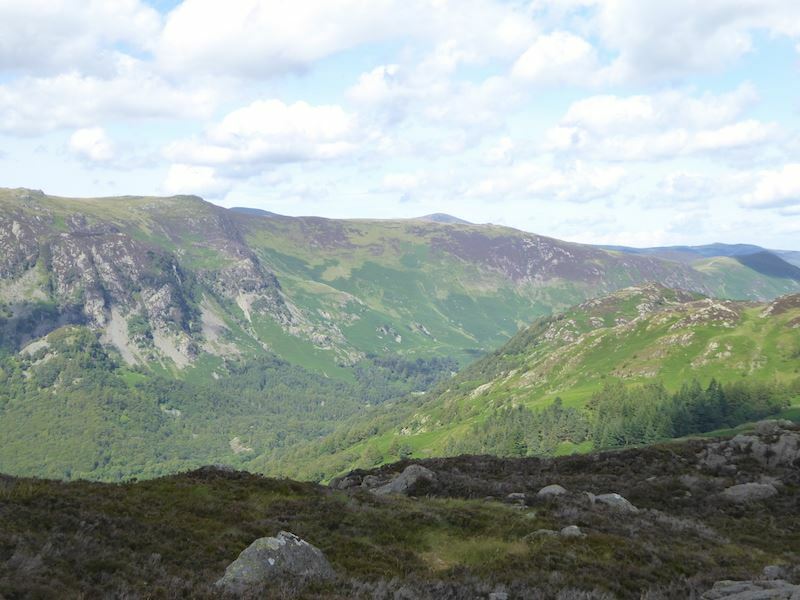 Looking over towards High Spy and Maiden Moor, also bathed in sunshine. 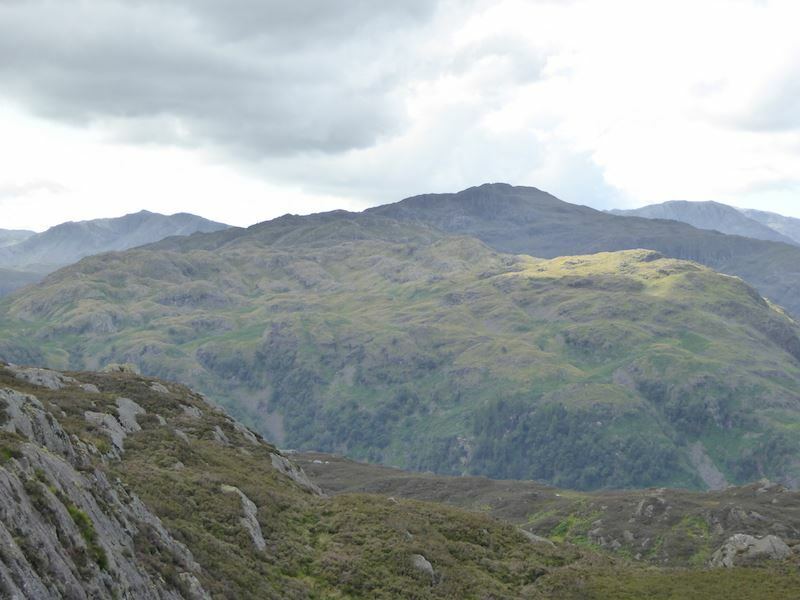 Still on Great Crag summit with Kings How, just above the trees towards the bottom right. 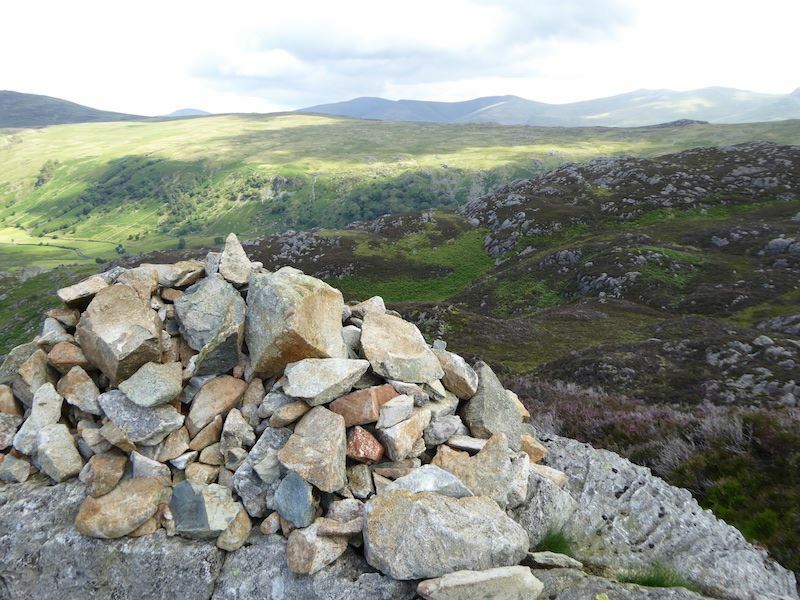 Looking across to Grange Fell and beyond that is Skiddaw. I am now heartily fed up with this large grey cloud hanging over us. 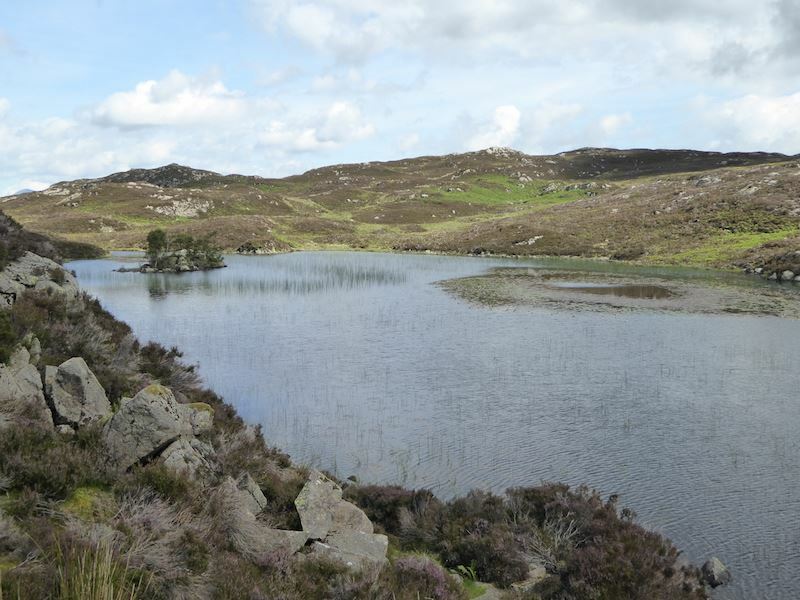 At least Watendlath tarn has a bit of brightness, unlike High Seat just above it. 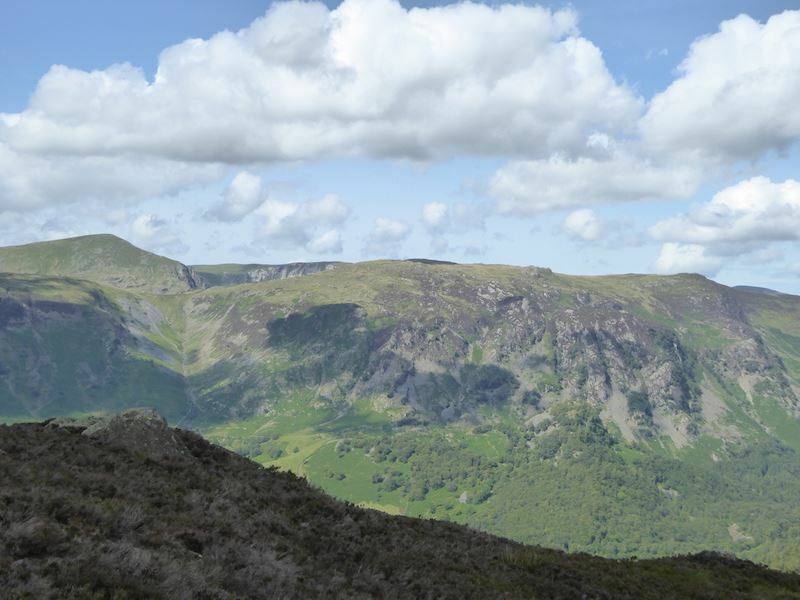 Looking east towards the Dodds and the Helvellyn range from Great Crag summit. 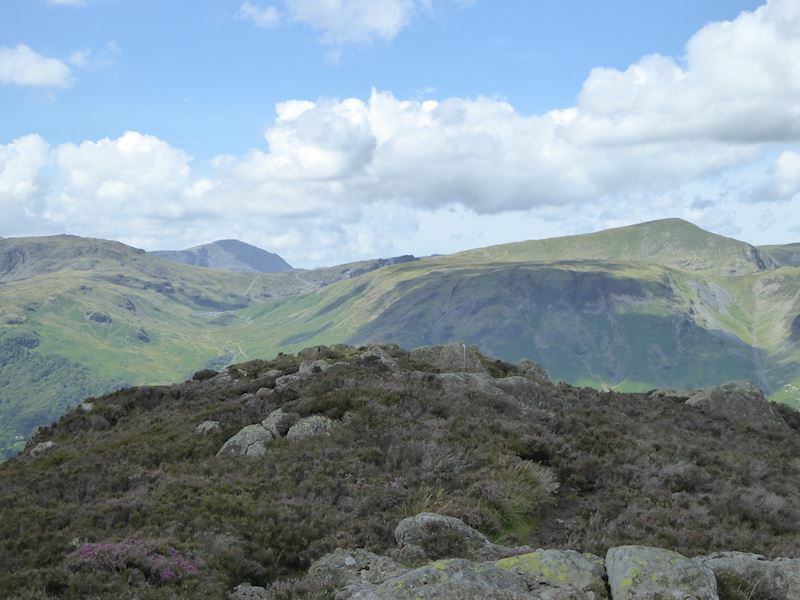 The Dodds over on the left and the start of the Helvellyn range on the right. 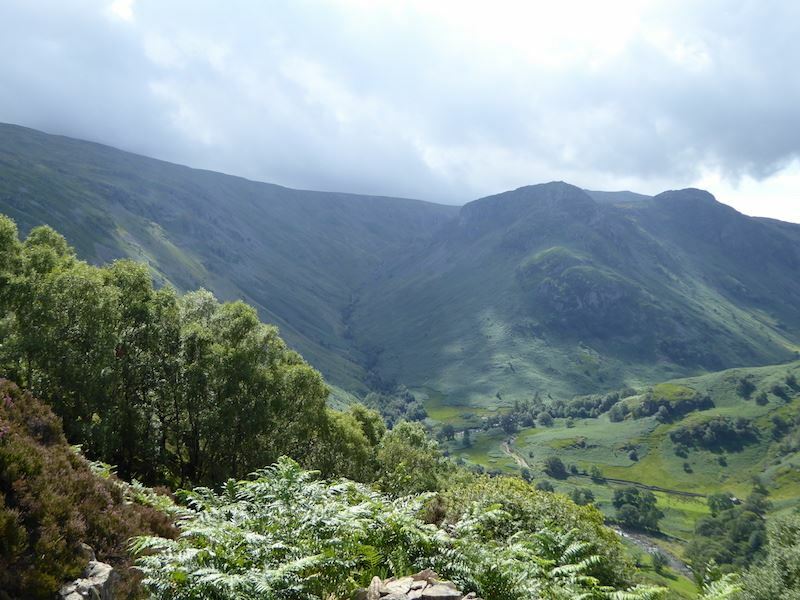 Looking across to High Saddle and Ullscarf, I wish this cloud would shift, its taking all the colour from everything. 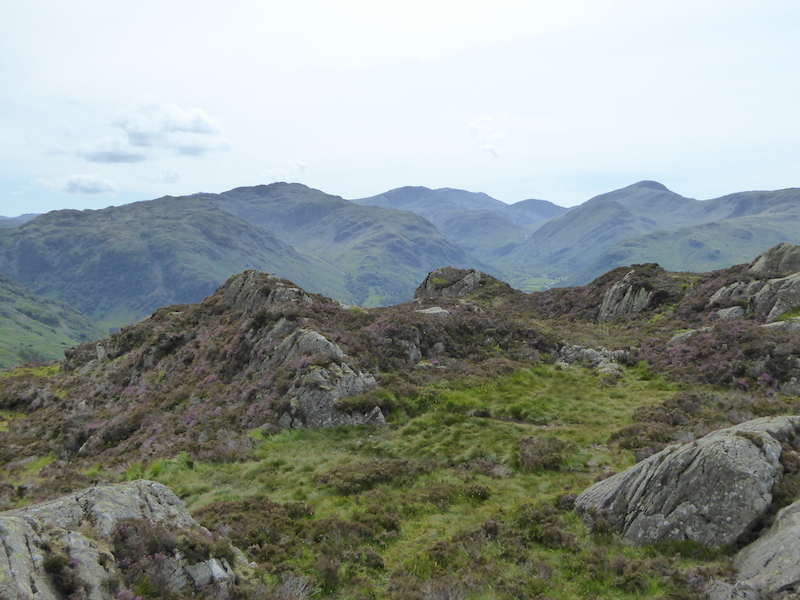 On the skyline, High Raise on the left and Pike O’Stickle on the right, below them the two dark masses of Eagle Crag and Sergeant’s Crag. 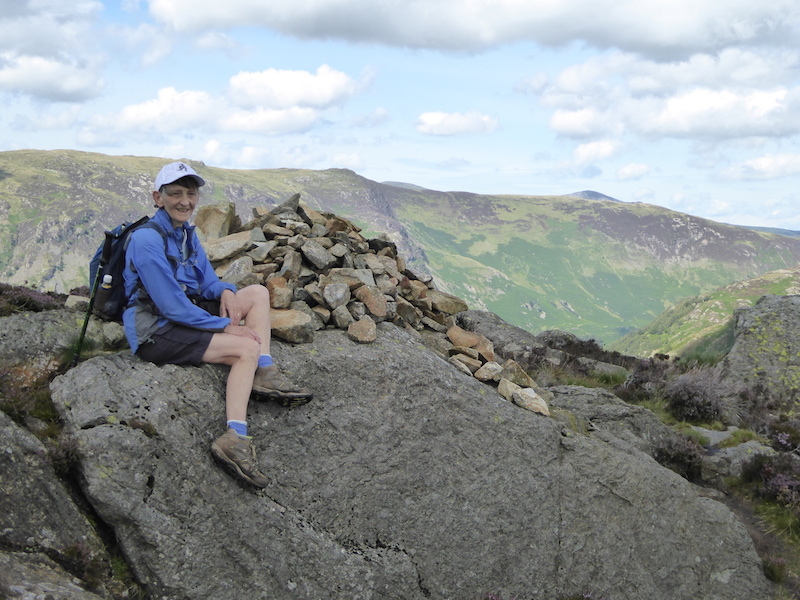 On Great Crag summit with Maiden Moor behind me, and in case you hadn’t noticed, the cloud returned and the jacket has had to go on. 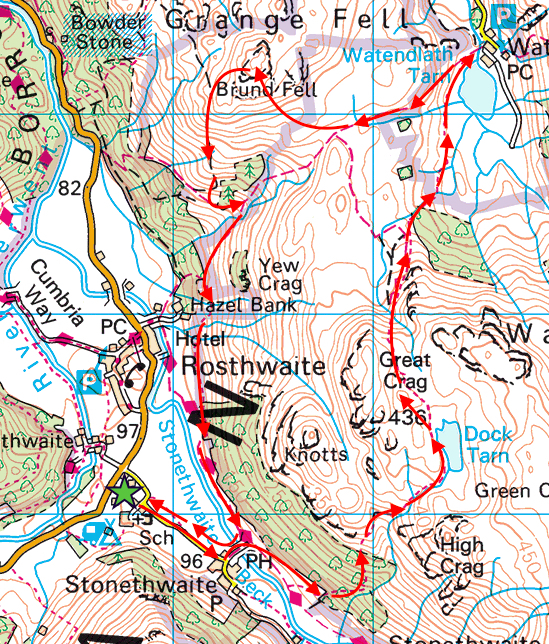 We’ve walked down off Great Crag and are approaching Watendlath Tarn. On the way down we met a young couple with two very young children coming up. 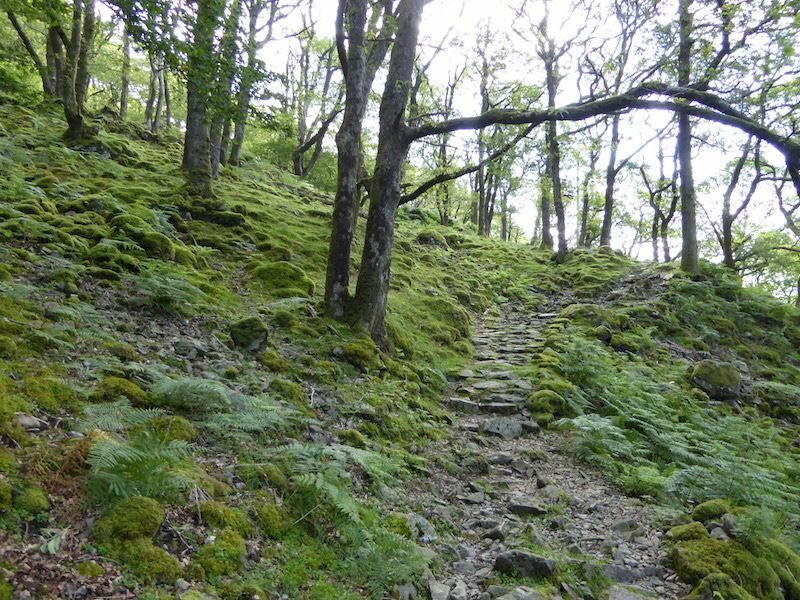 They asked us for directions to Stonethwaite which we gave them. 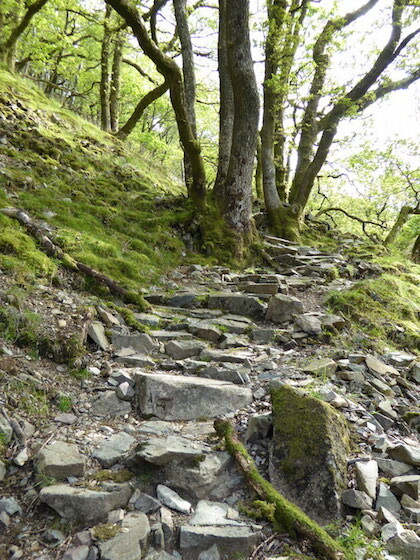 When I noticed Mum was sockless and wearing flat, thin strapped sandals I pointed to my mud caked boots and mentioned the state of the path and that she might ruin her sandals and get very muddy feet. She didn’t seem in the least concerned about any of that though and off they went. 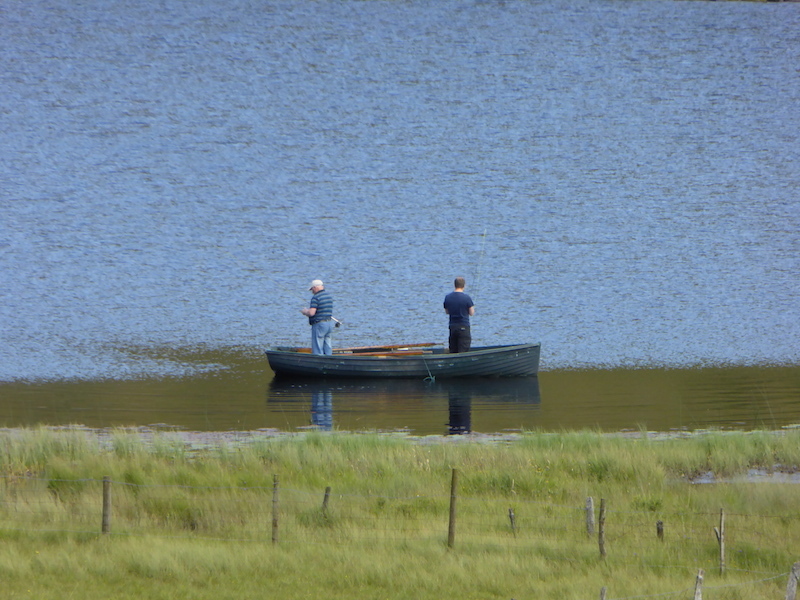 Two men in a boat concentrating on their fishing in Watendlath tarn. 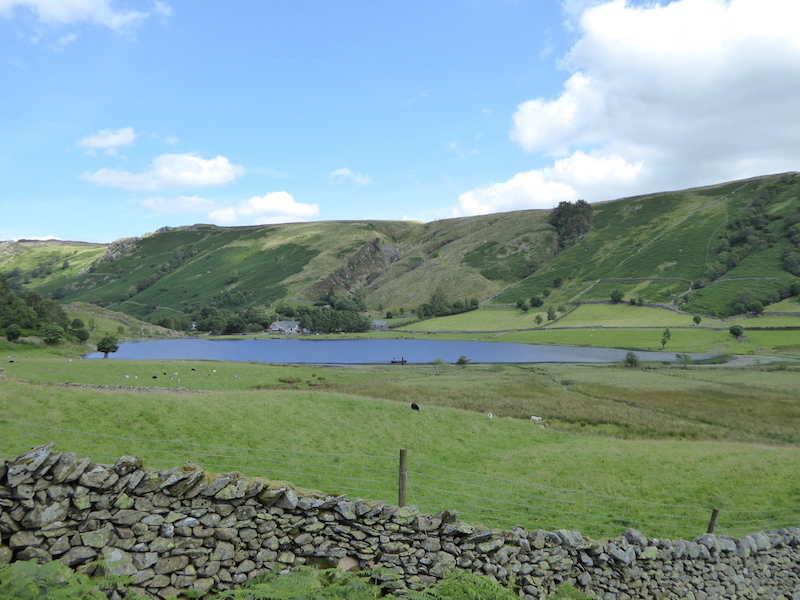 Watendlath Tarn and Great Crag from near the bridge at Watendlath. The net across the outflow stops the fish doing a runner, or should that be a swimmer? 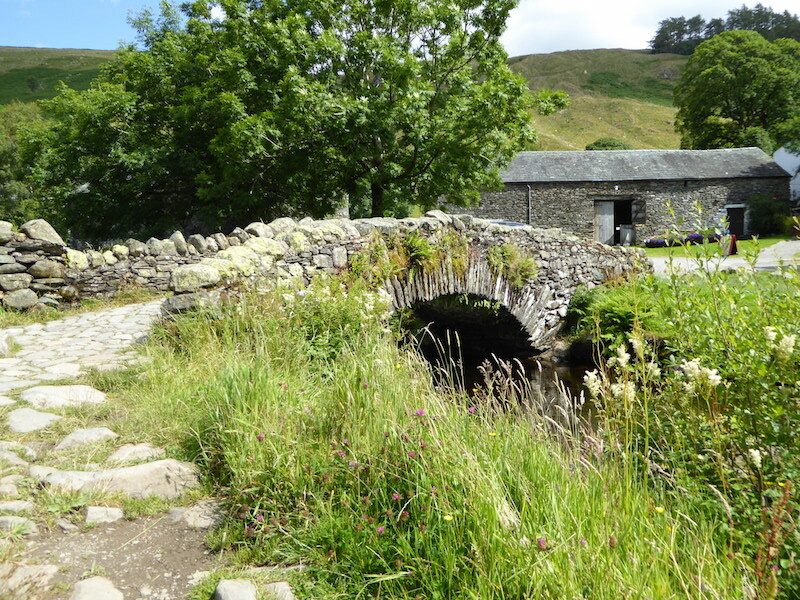 Watendlath bridge. Loads of people around here today, I was glad to leave, it was too busy. 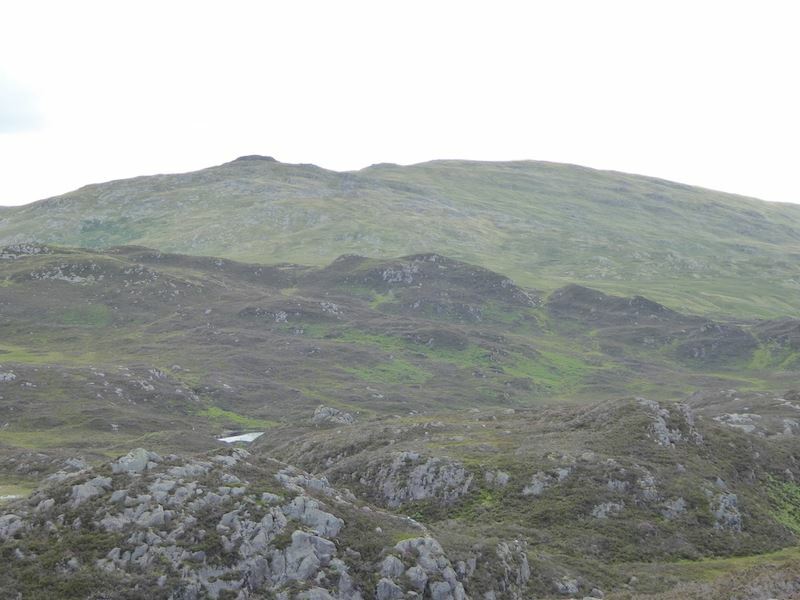 On the right skyline is Great Crag where we have just spent what seemed like a lifetime under a great big grey cloud. Now its sunny over there, typical. 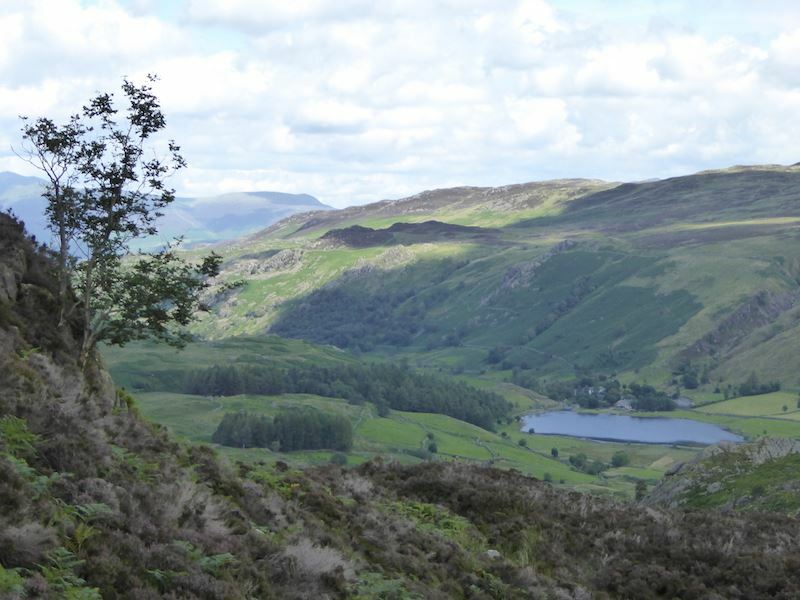 A view to the east from the path over to Grange Fell. 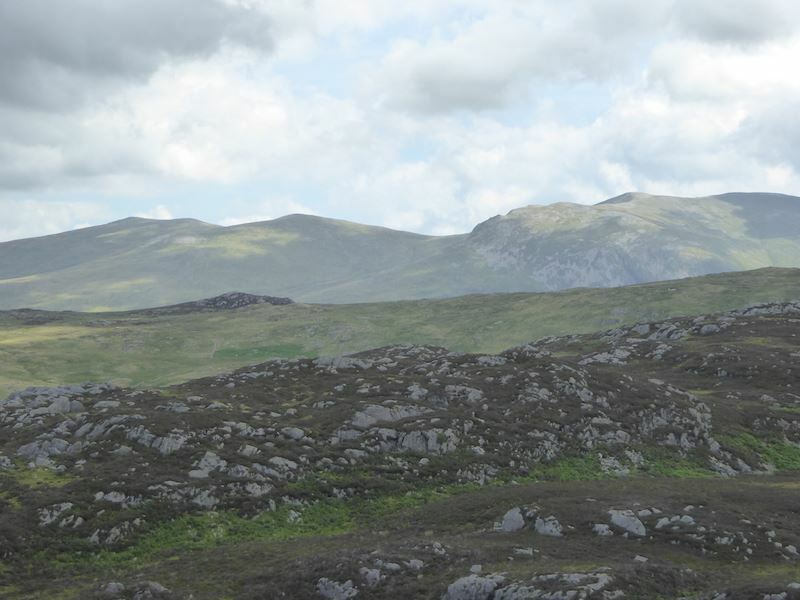 High Saddle on the right skyline. 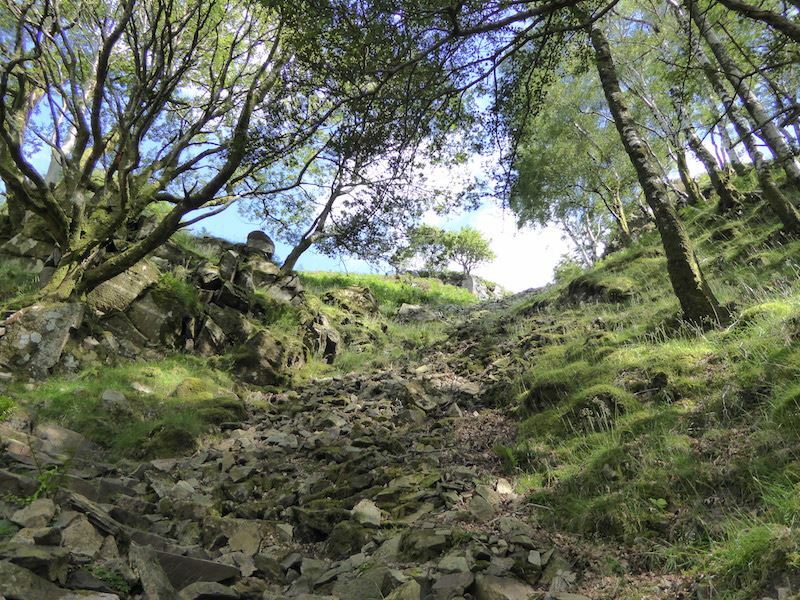 Time to leave the Puddingstone Bank path and head over the squelchy grass to the stile down there. 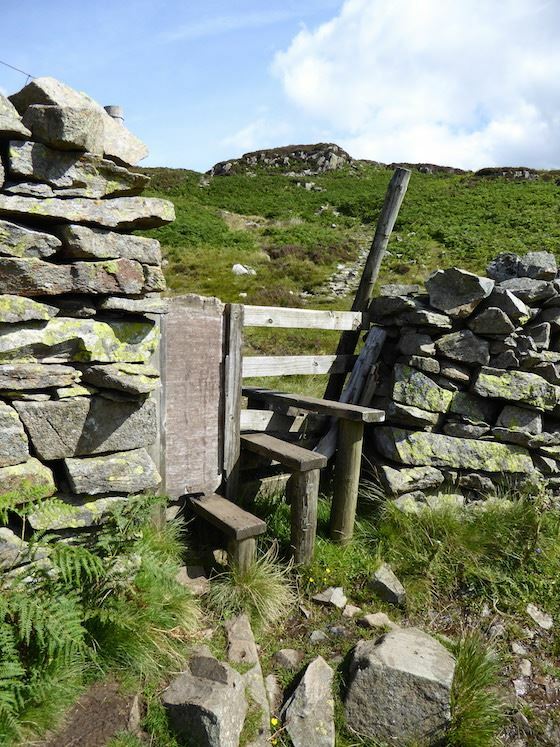 Looks like some much needed stile repairs are about to take place. 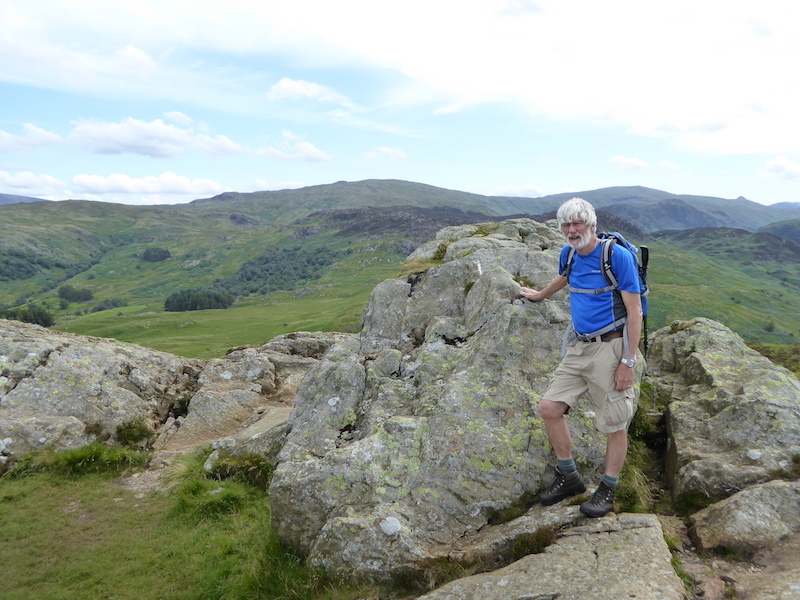 On Brund Fell, the summit of Grange Fell. I think somebody will be going for a haircut before much longer. 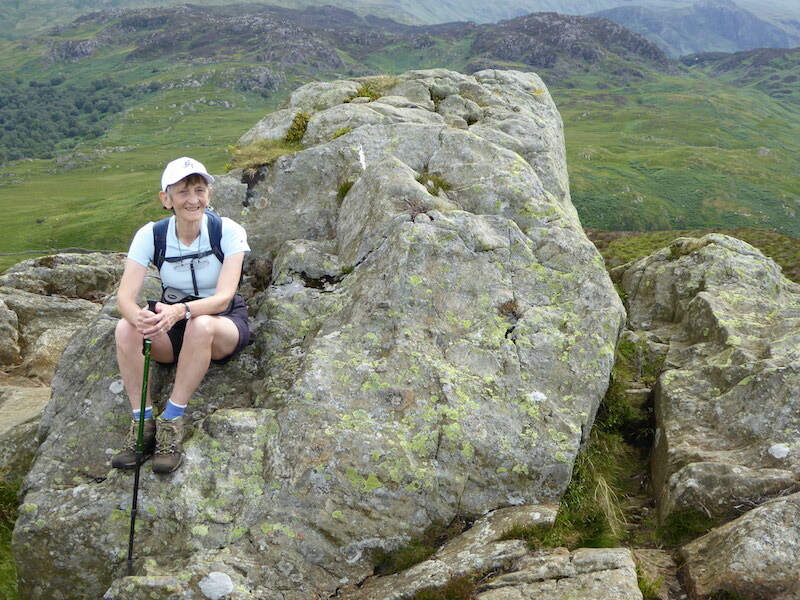 On Grange Fell summit and sheltering from the keen wind behind this handy rock. 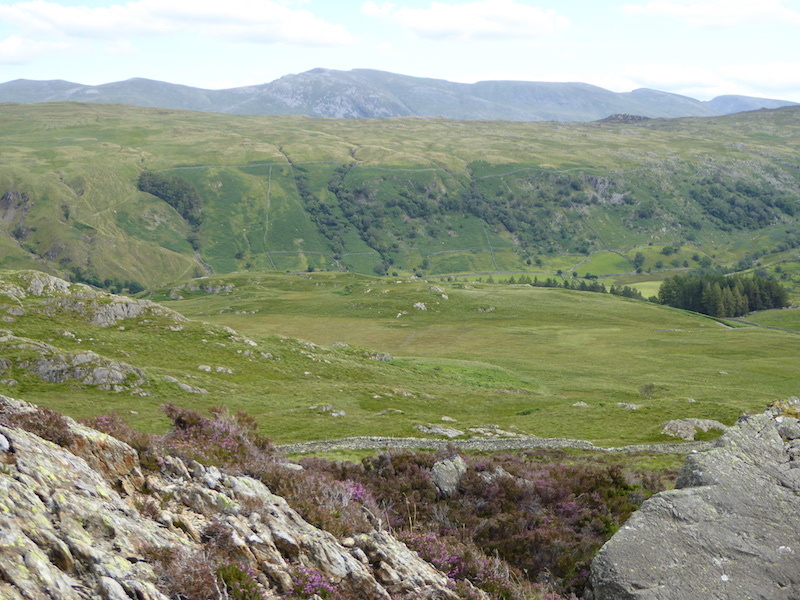 Looking east over the High Tove and Armboth ridge to the Dodds and the Helvellyn range. 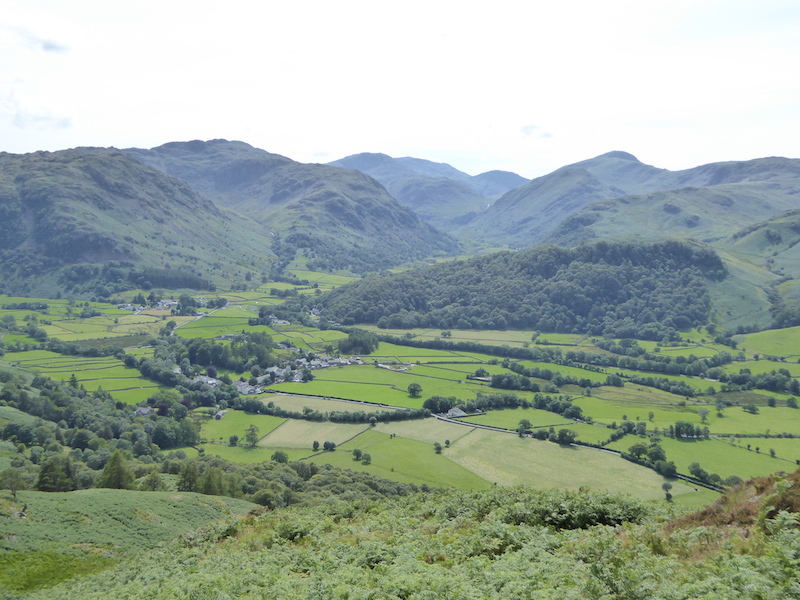 Looking south to the Borrowdale Fells from Grange Fell. 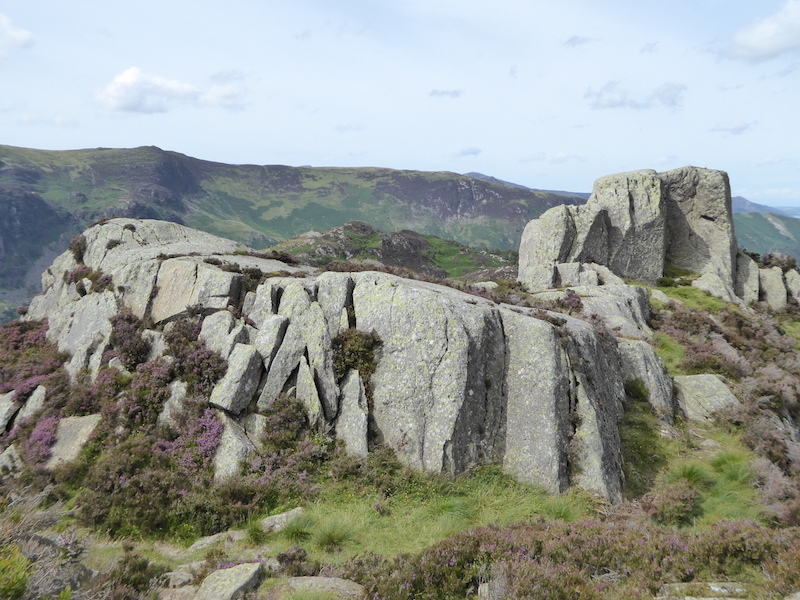 Huge outcrop on Grange Fell, Maiden Moor beyond. 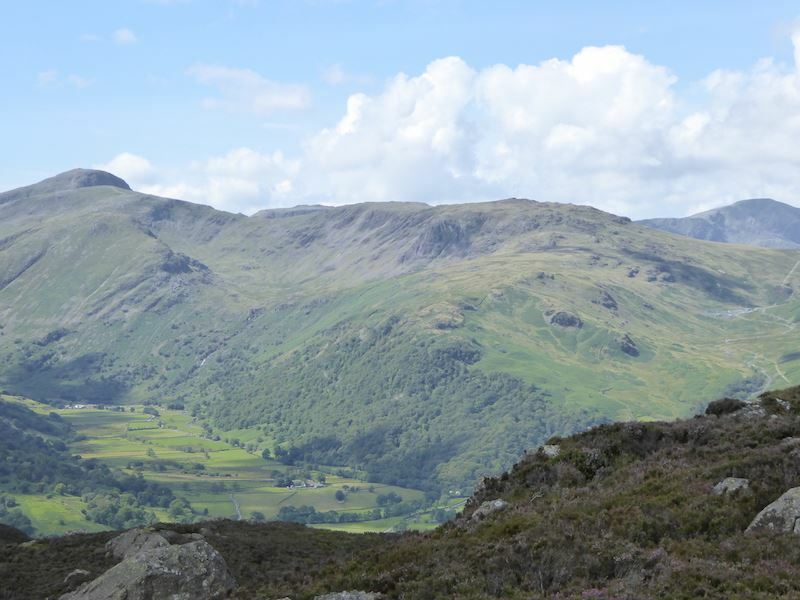 Looking towards Great Gable, on the centre skyline, across Borrowdale. 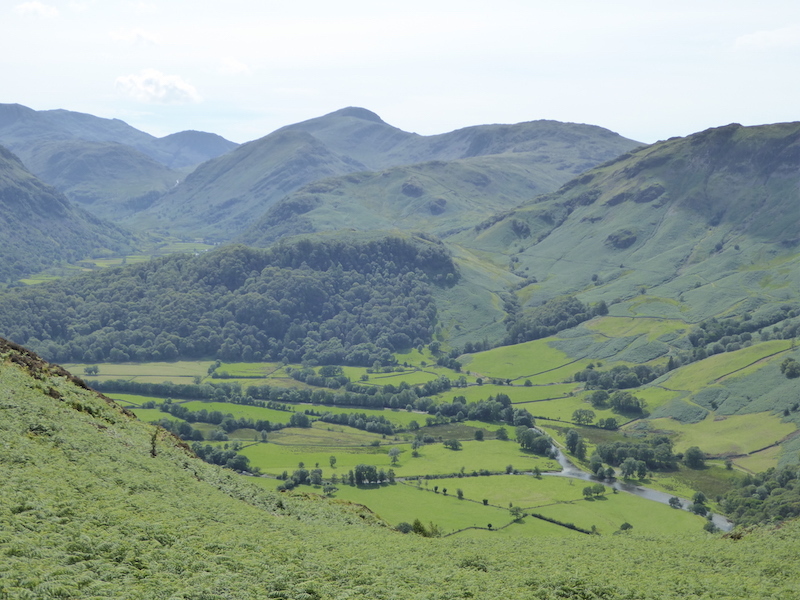 A longer view of the valley and the fells at the head of it as we descend from Grange Fell. 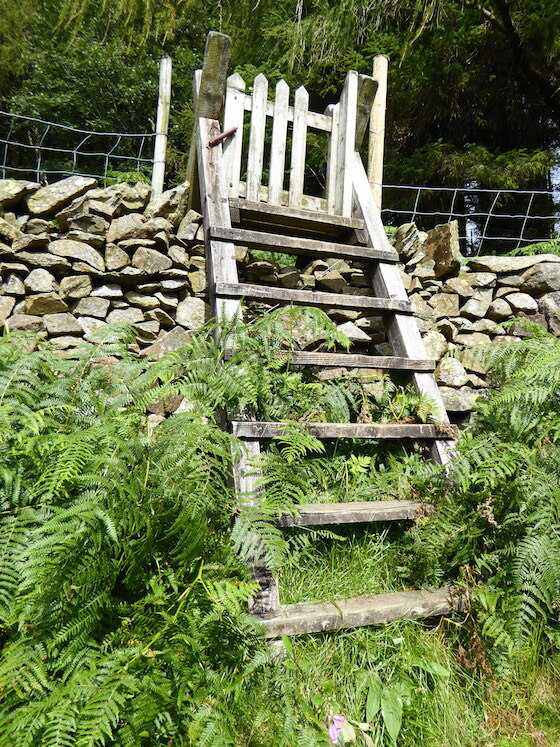 Watch out for nettles, there’s often one lurking below a stile just waiting for an unwary bare leg! 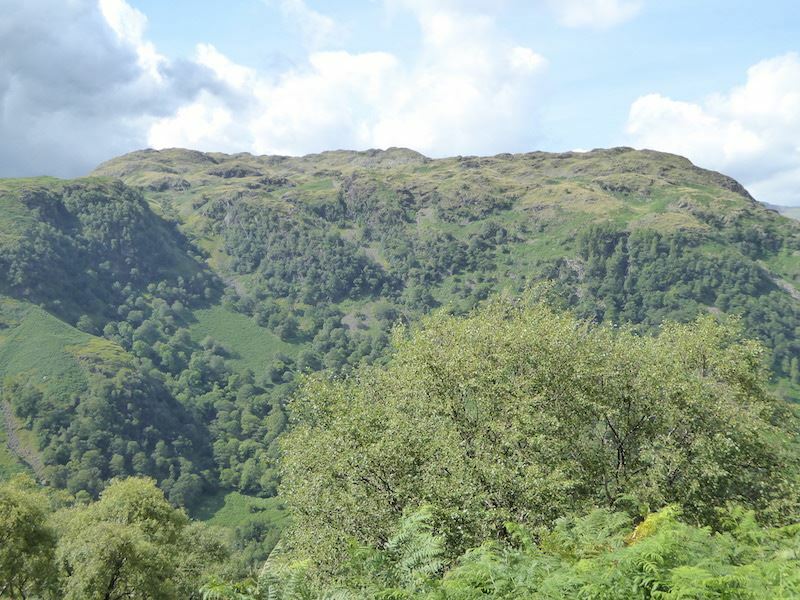 We’re back down in the valley now and heading back to Stonethwaite, there’s a lot more detail showing on Eagle Crag than there was this morning.